Mac OS X Infinite is an interesting piece of software which tries to show you how an Apple Mac system might work without the need of having to purchase one. In essence, this application installs itself and provides you with some tools and layout design elements which might seem like you're sitting in front of an installation of Mac OS X. The artwork of this program is beautiful as it relies heavily on what Mac OS X is supposed to be. You get to enjoy playing around with the dock, lovely icons, shortcuts and even the web browser. 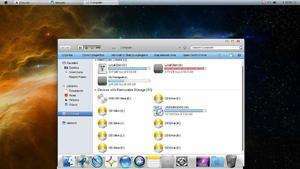 For security reasons, you should also check out the Mac OS X Infinite download at LO4D.com which includes virus and malware tests. Additional screenshots of this application download may be available, too.